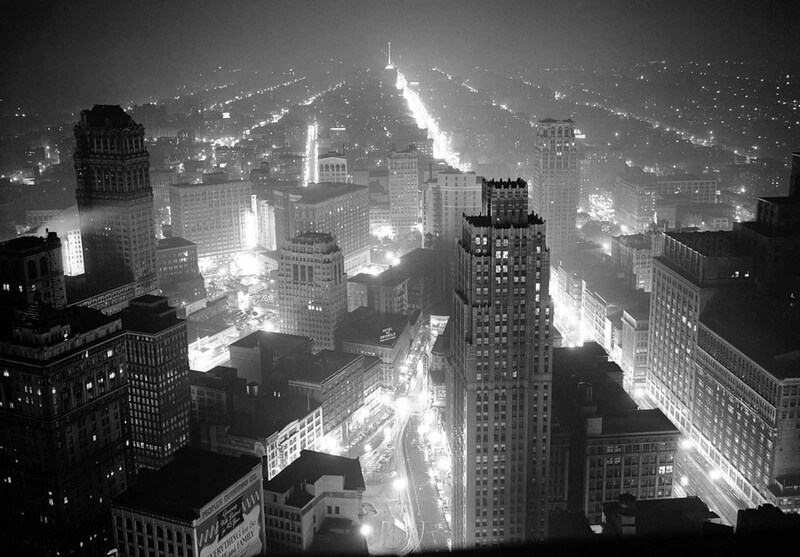 Detroit and the industrial region surrounding it, was plunged into semi-darkness as all except street lights and in war factories went out for fifteen minutes during a blackout drill on May 4, 1942. Thirty vivid, oversize black-and-white photos from the Library of Congress show the Detroit in the 1940s. Full-screen scenes show vintage vehicles, fashions, hairstyles, the Crowley-Milner department store, Cunningham’s drugs, a streetcar, Chrysler’s tank assembly workers, tense integration of the Sojourner Truth Homes federal housing project in 1942 and five images from June 1943 rioting. The early part of the 20th century saw the city of Detroit, Michigan, rise to prominence on the huge growth of the auto industry and related manufacturers. 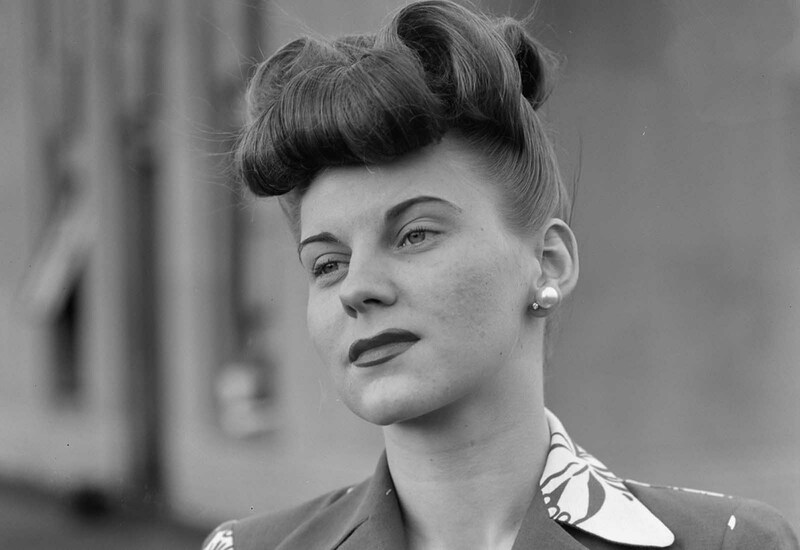 The 1940s were boom years of development, but the decade was full of upheaval and change, as factories re-tooled to build war machines, and women started taking on men’s roles in the workplace, as men shipped overseas to fight in World War II. 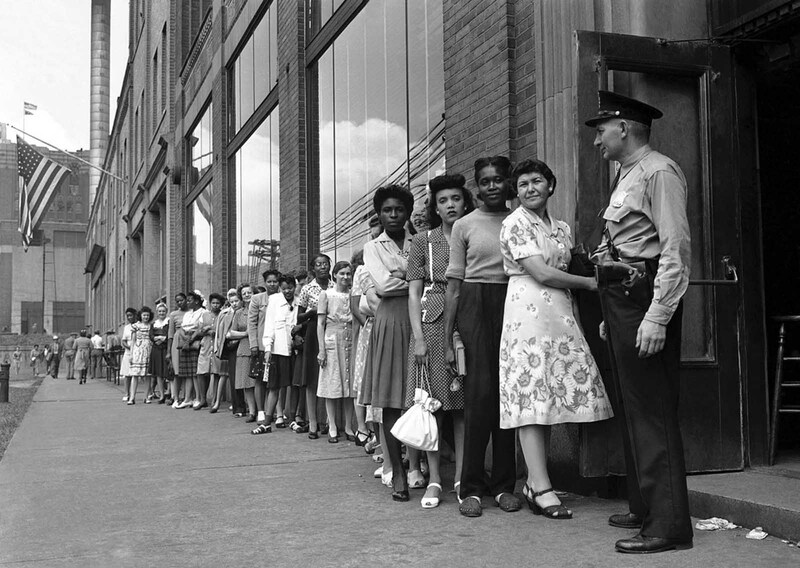 The need for workers brought an influx of African-Americans to Detroit, who met stiff resistance from whites who refused to welcome them into their neighborhoods or work beside them on an assembly line. A scene from a fashion show presented by the Chrysler Girls’ Club of the Chrysler Corporation at Saks Fifth Avenue store in Detroit in the spring of 1942. 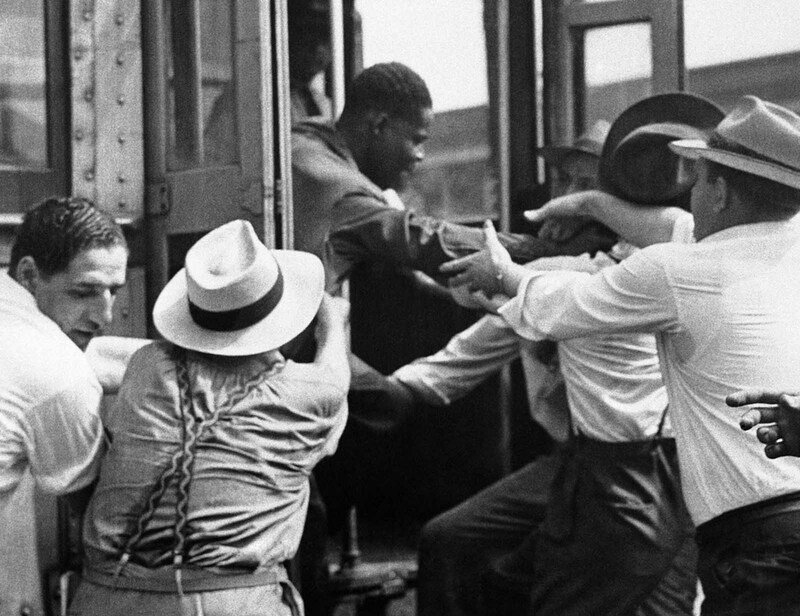 Sparked by seemingly minor altercations amid aggressive white resistance to black labor flocking to the city’s factories during America’s ramped-up war effort, the Detroit riots (June 20-22) killed 34 people — 25 African Americans, nine whites — wounded hundreds more and damaged and destroyed property worth millions. What’s more, the street violence at home exposed how thin the veneer of “common purpose” truly was across some segments of society, even as Americans were fighting and dying overseas. Just one example of the country’s racially charged hostilities: In the spring of 1943, more than 20,000 white workers at a Detroit plant that produced engines for bombers and PT boats walked off the job in protest over the promotion of a small handful of black workers — a protest hardly emblematic of a nation seamlessly joining together to battle a common enemy. After World War II ended, the demand for workers dried up, and Detroit started plotting its postwar course, an era of big automobiles and bigger highways to accommodate them. At its peak population of 1,849,568, in the 1950 Census, the city was the 5th-largest in the United States, after New York City, Chicago, Philadelphia and Los Angeles. 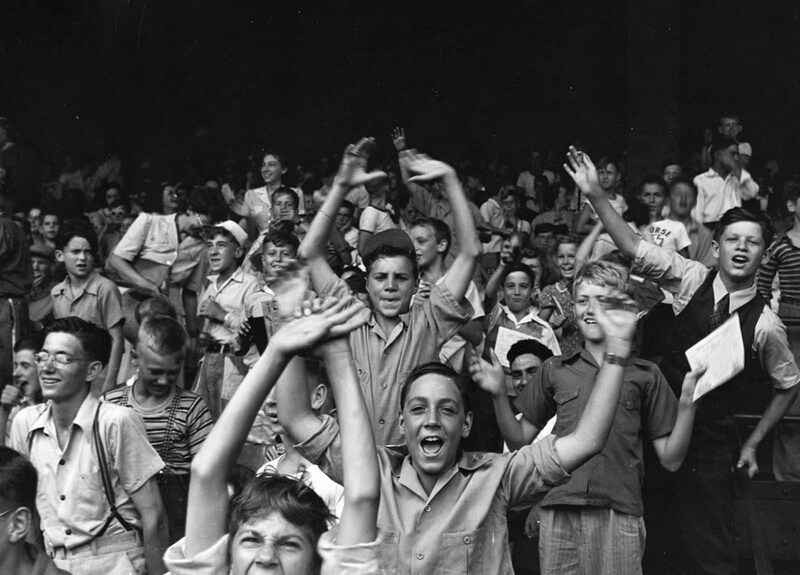 Kids at a ball game at Briggs Stadium, Detroit, August, 1942. 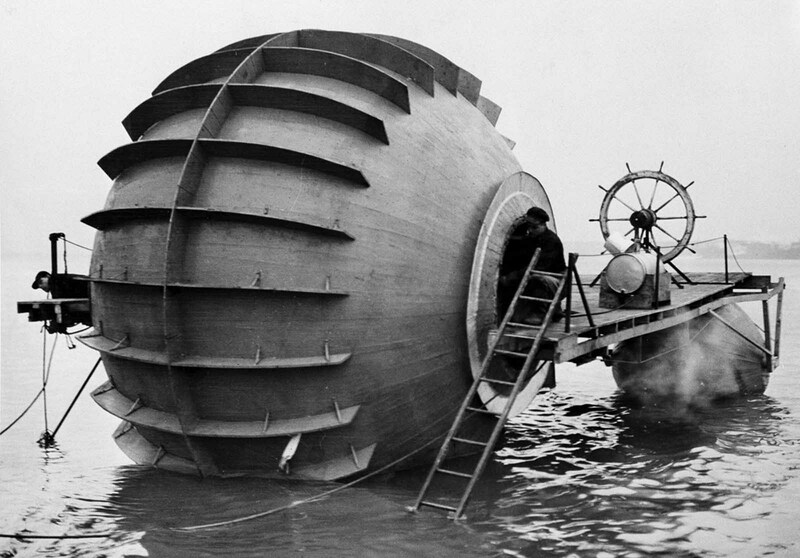 This strange watercraft, an experimental “torpedo boat,” performs test runs in the Detroit River, near Detroit, Michigan, on December 28, 1940. The large wheel is powered by a 360 horsepower motor. T.F. Thompson of Des Moines, Iowa, and A.W. Reed of Windsor, Ontario, designed the craft, which they hope will reach a top speed of 300 miles-per-hour. 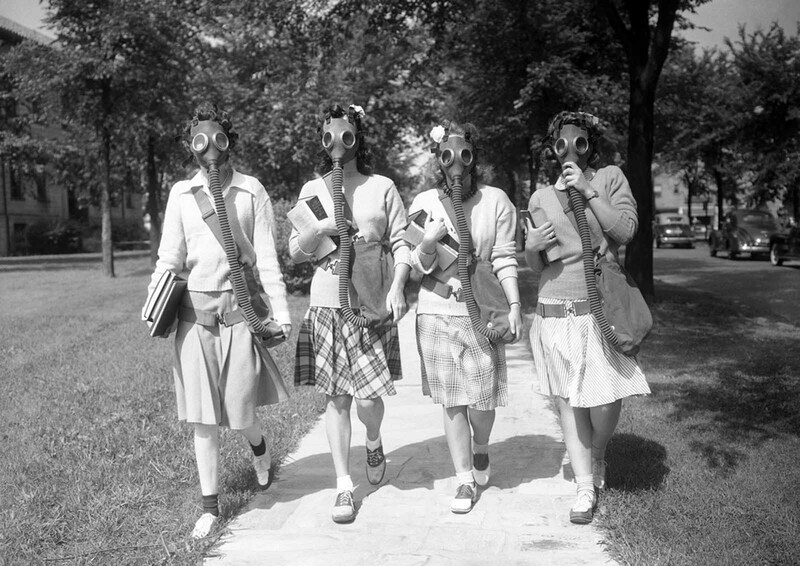 Looking ahead to the possibility that gas masks may some day be a necessary part of their ensemble, these University of Detroit students were trying out masks in a practice drill on the campus on June 23, 1942. Hidden behind the masks, which they soon learned to wear with a minimum of discomfort, are, from left: Mary Turner, Helen Williams, Evelyn Buss and Joan Joliet. The sign at the left, “My running days are over. 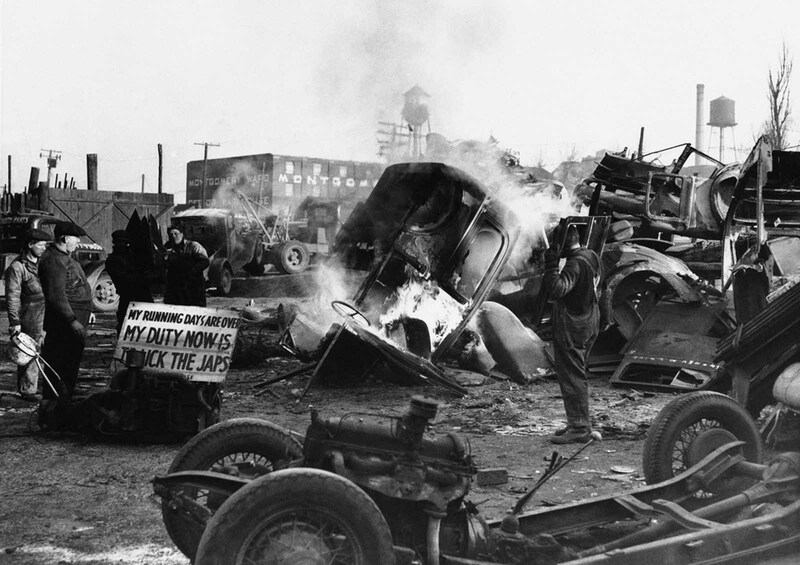 My duty now is to lick the Japs,” explains what is happening to these onetime automobiles in Detroit, Michigan on January 23, 1942. Wrecking crews are burning out the bodies of junked cars to destroy parts unfit for conversion into steel and thus simplify the metal-reclaiming process. In Detroit’s Crowley-Milner department store, the head of the art department works with a new mannequin in July of 1941. 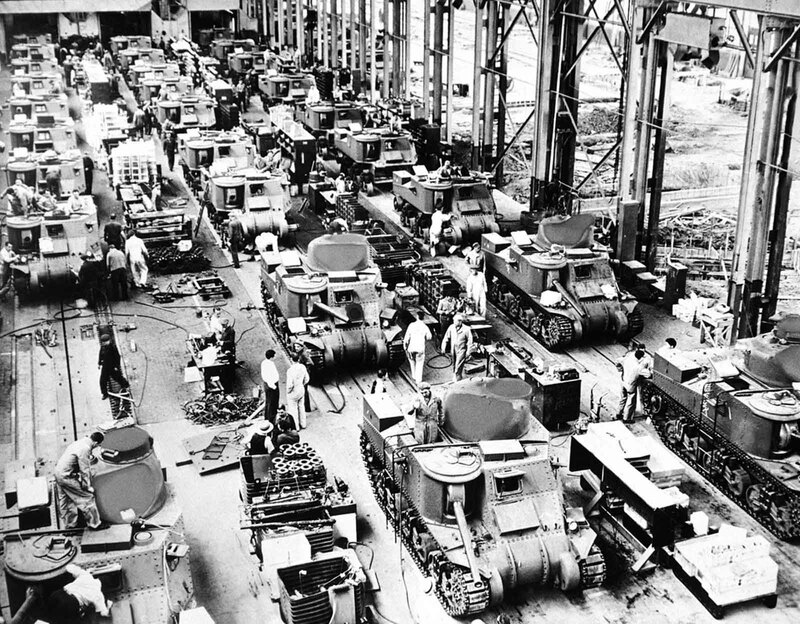 In this July 4, 1942 file photo, 28-ton tanks, called “General Grants” by U.S. forces in the Middle East who used them in the battle for Egypt, are turned out in mass production by the Chrysler Corporation’s tank arsenal in Detroit. 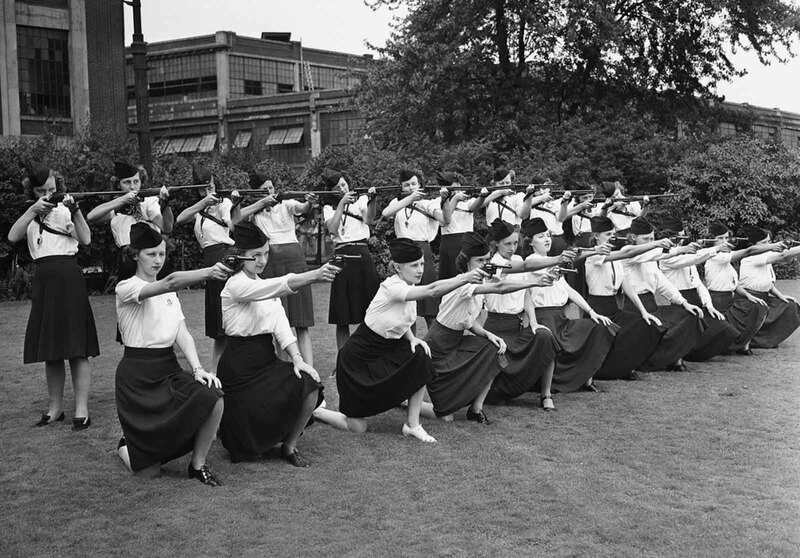 Female guards, placed on duty at the Naval Ordnance Plant, operated by the Hudson Motor Car Company in Detroit, Michigan, learn how to sight guns on August 7, 1942. In the front row, the girls sight 38 caliber police pistols; those in the back row with 30-30 rifles. At present the girls are unarmed, serving only as escorts for persons entering the plant, but are using weapons on the target range in preparation. Detroit, Michigan. 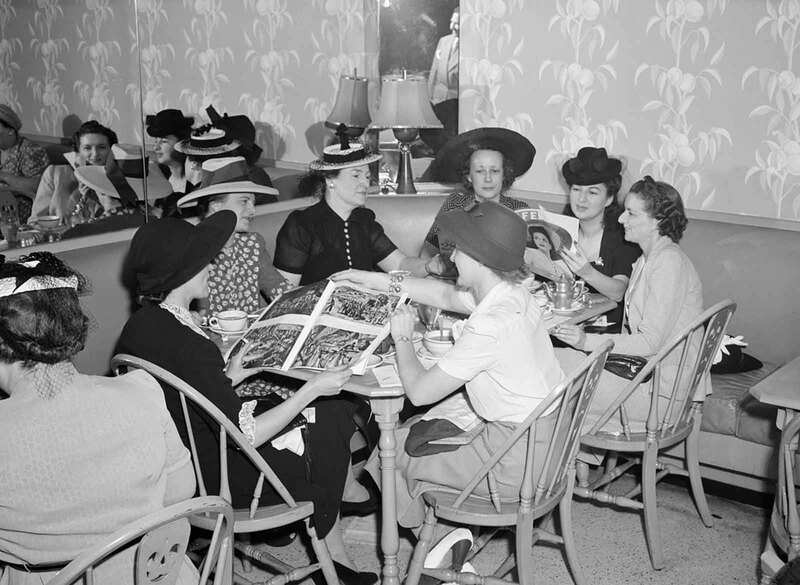 Shoppers at lunch at the Crowley-Milner department store in July of 1941. 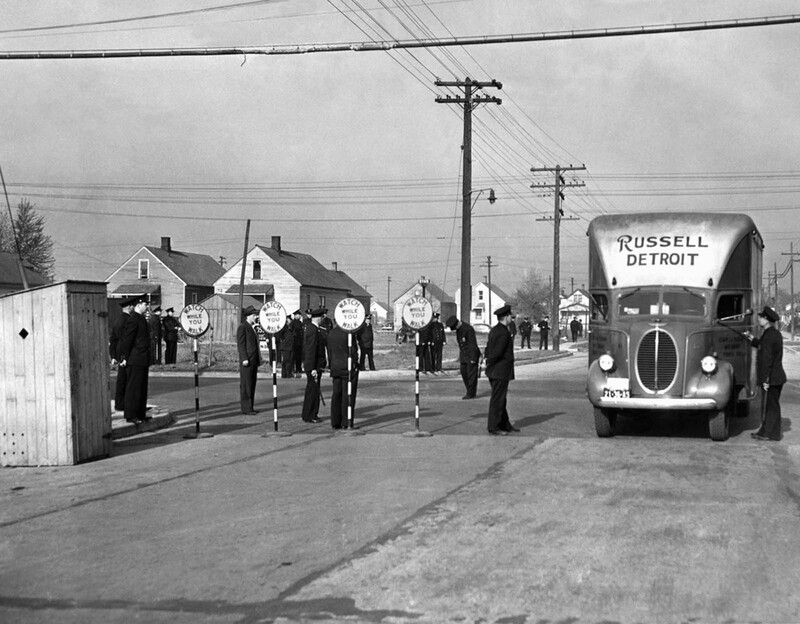 Guarded by more than 1,500 state troops, city and state police, moving vans carried the household goods of black families into Sojourners Truth, a federal housing project located in a white section of Detroit, on April 29, 1942. White protesters, whose previous attempts to prevent blacks from moving in ended in rioting, were dispersed. 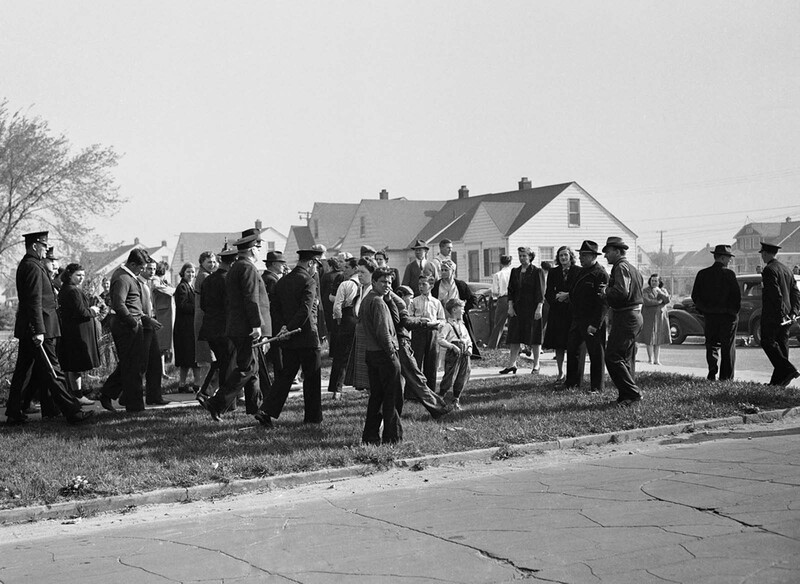 Detroit police disperse white picketers who objected to occupancy by blacks of Sojourner Truth Federal housing project, erected in a predominately white neighborhood, on April 29. 1942. 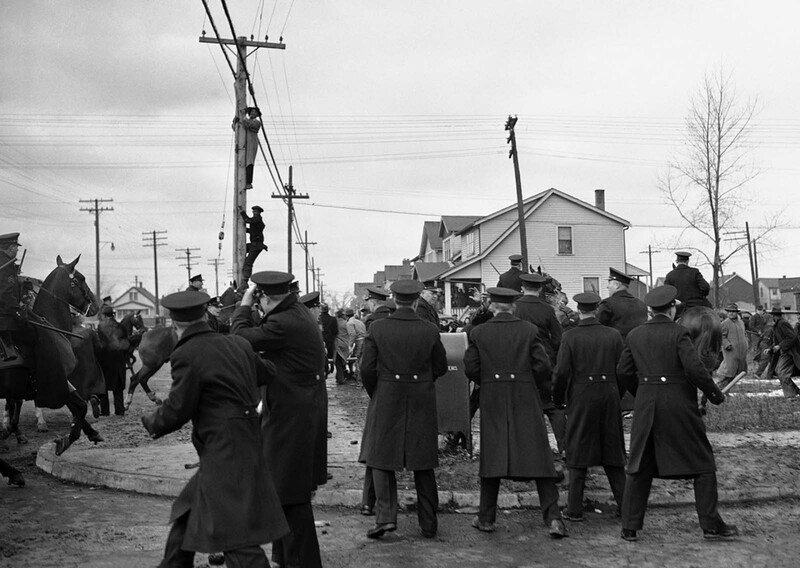 Stones flew despite a police riot squad’s efforts to maintain order in Detroit, on February 28, 1942 between prospective Black tenants of a million-dollar defense housing project and white picketers who halted their moving vans. Several were hurt in the picket line skirmishes. 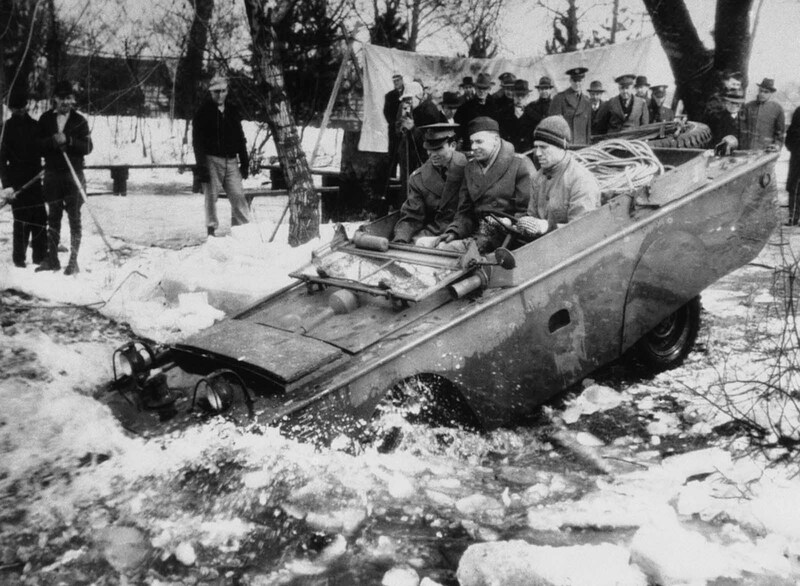 One of the newly-built quarter-ton four-wheel amphibian jeeps, produced for U.S. fighting forces, leaves solid ground for a test-run in an ice-clogged stream in the Detroit area on March 23, 1943. Gas mask production. 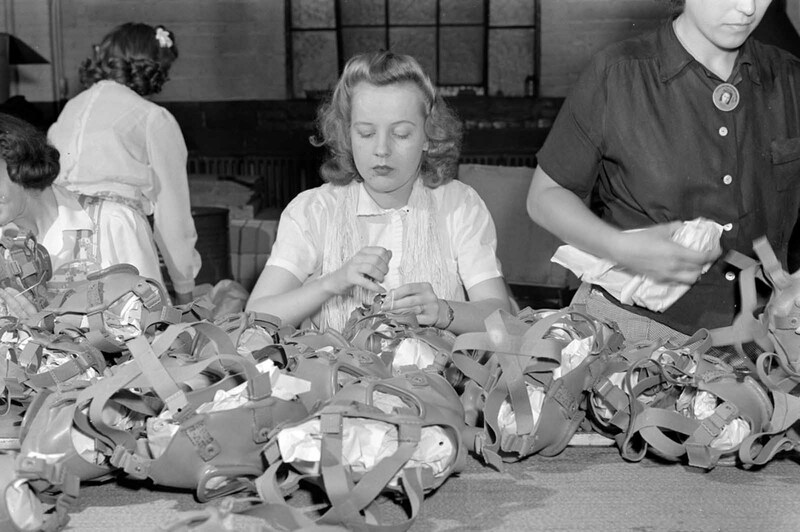 Lacing head harnesses of gas masks after they have passed through all the stages of assembly and made ready for packaging, is the job of this young woman who works in the Eureka Vacuum factory which has been converted to war production. A woman passenger climbs out of the rear window of a tram in Detroit, Michigan, on June 21, 1943, after a mob halted the car in an effort to remove the black passengers on board during race riots. 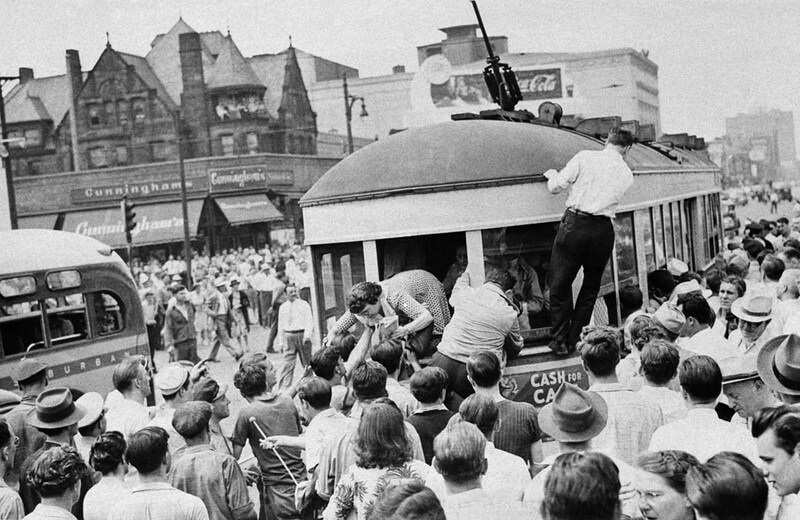 A man is dragged from a street car on June 21, 1943, during fighting near Detroit’s downtown section. 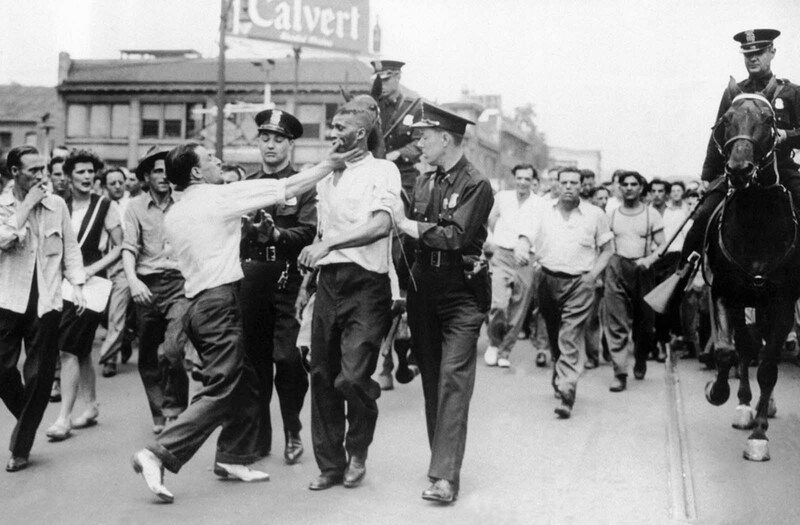 Police attempt to break up an incident as race rioting flared in the downtown area of Detroit on June 21, 1943. Troops were called in at the request of Michigan Governor Harry F. Kelly when police were unable to stop the fighting. 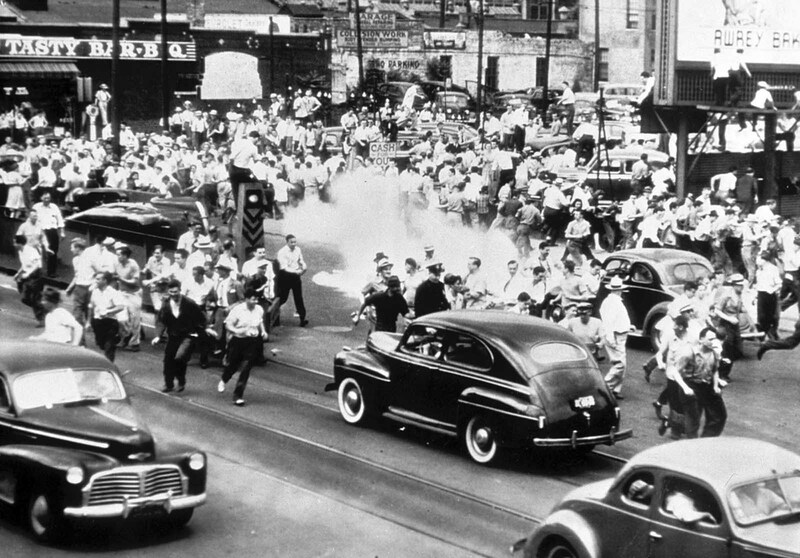 Police use tear gas to disperse a crowd gathered on the main street of Detroit, Michigan, in an effort to halt race rioting on June 21, 1943. 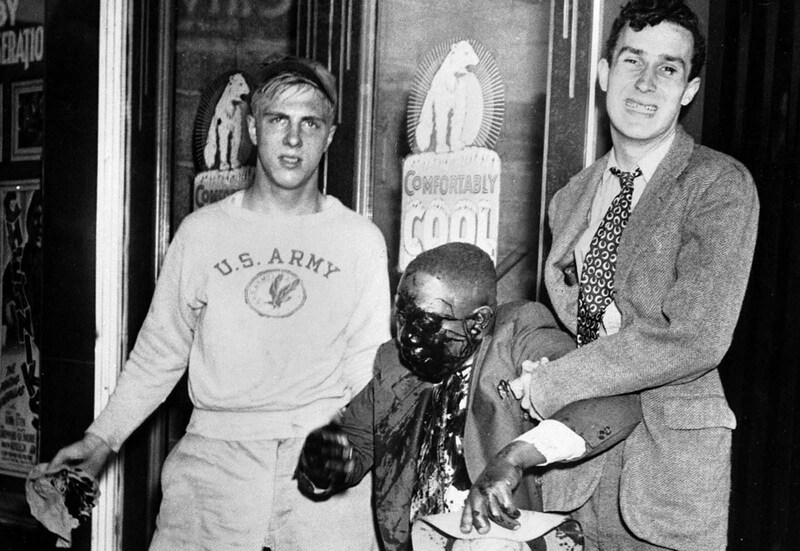 Two youths help a man to his feet after he was badly beaten in street fighting which marked race riots in Detroit, Michigan, on June 21, 1943. 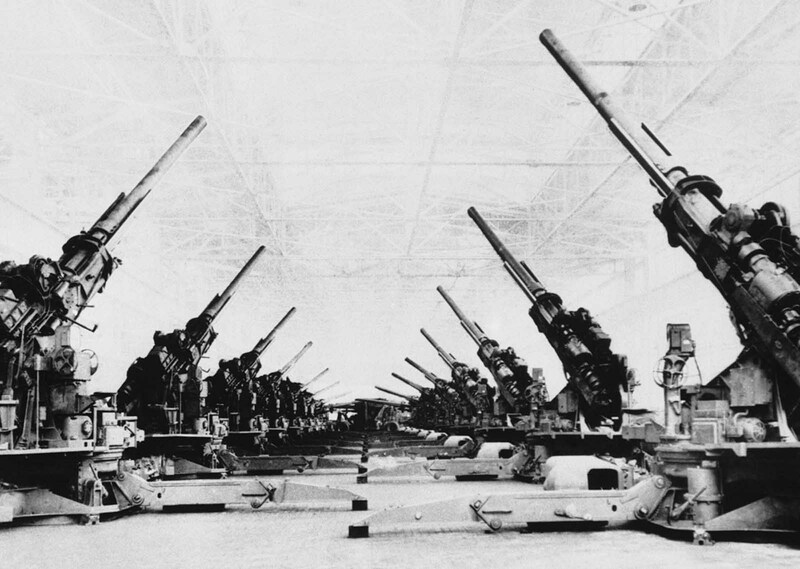 Huge anti-aircraft guns, the U.S. Army’s new powerful Stratosphere guns, are lined up in the final assembly area of the Grand Rapids stamping division of Fisher Body in Detroit on June 1, 1944, prior to shipping. U.S. soldiers from every state shipped off to war. 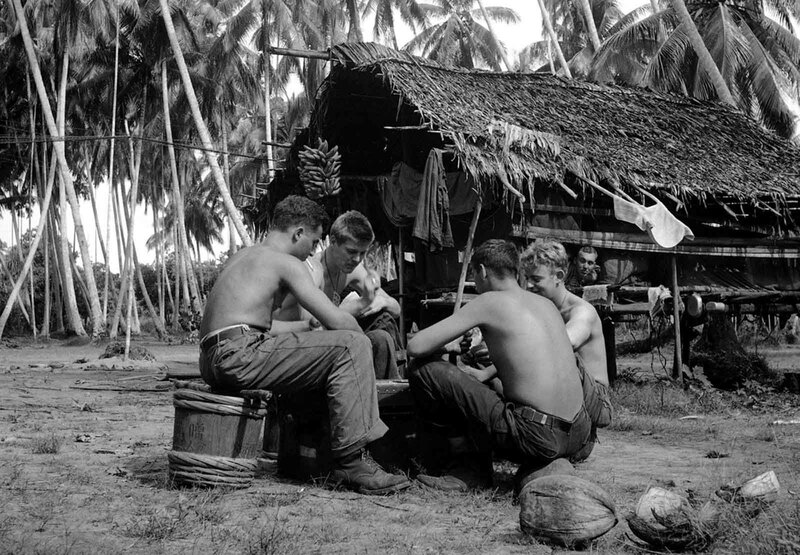 Here, after taking part in the fighting, soldiers (two from Detroit) relax by playing cards in a palm grove behind the lines at Buna, New Guinea on January 13, 1943. The players are, left to right: Pfc. Sam Demopolis, Detroit, Michigan,; Pfc. Robert Trudell (facing camera) of Detroit; Corp. James Williams (back to the camera); Genesee Depot, Wisconsin; and Pvt. Laurence Thompson, Duluth, Minnesota. 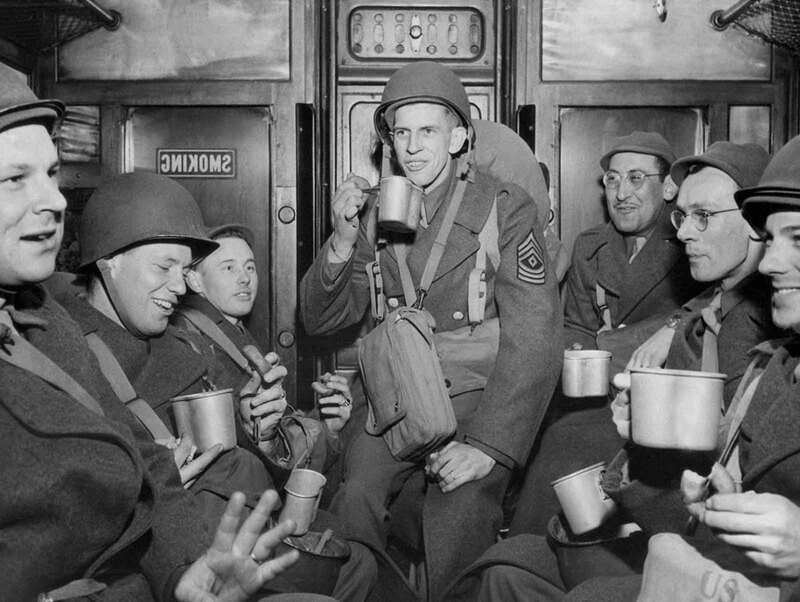 This group of soldiers who debarked from a transport drink from mugs of coffee and munch doughnuts on a troop train en route to their station in England, March 15, 1944. 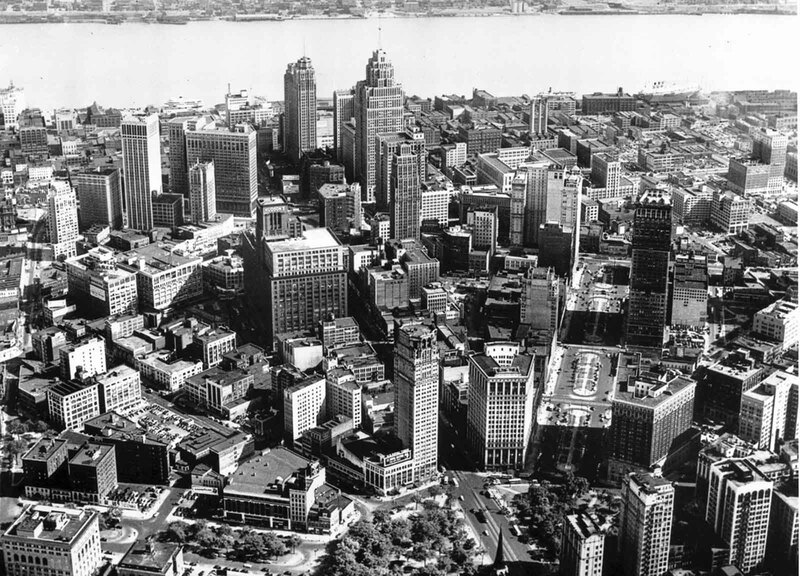 A view of Detroit, Michigan, taken by the Ford Motor Company’s advertising blimp on July 15, 1947. 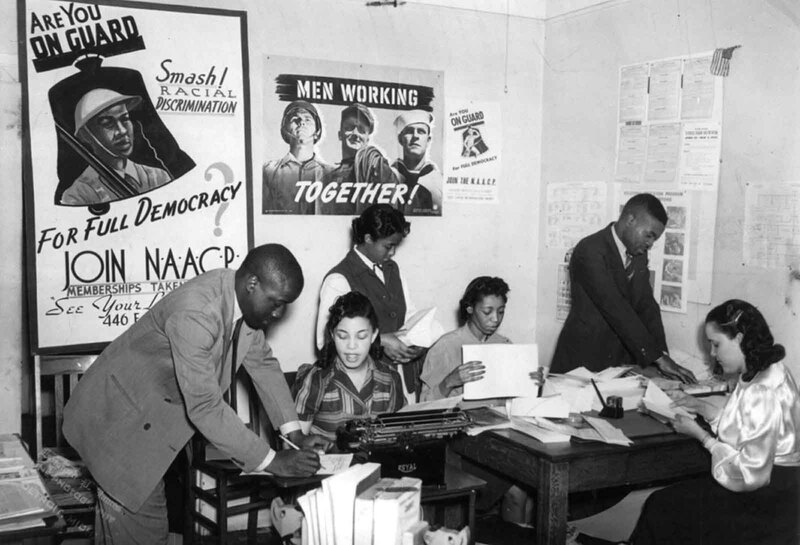 People work in the NAACP branch office in Detroit, Michigan, in the 1940s. 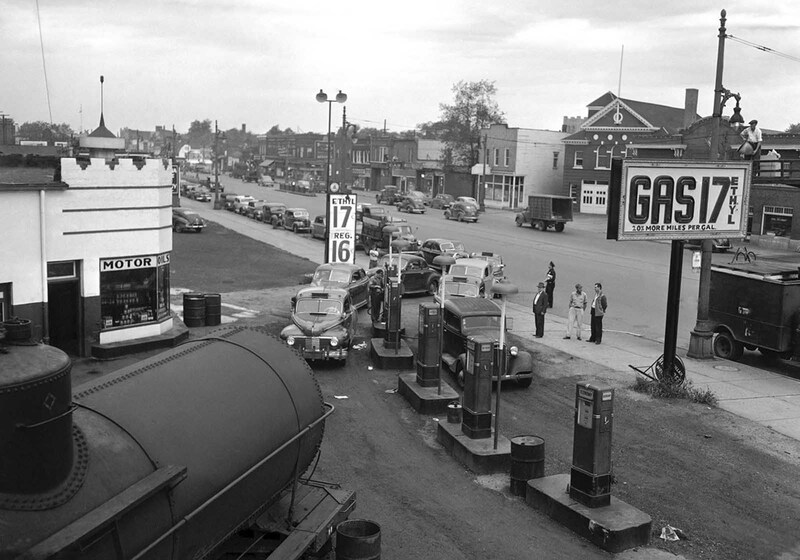 Motorists line a street waiting to buy gasoline at 17 cents per gallon at this station in Detroit on September 24, 1945. Such stations were not affected by a strike of Yank-Wacon truck drivers and did big business as nearly all other stations, supplied by truck, were closed. 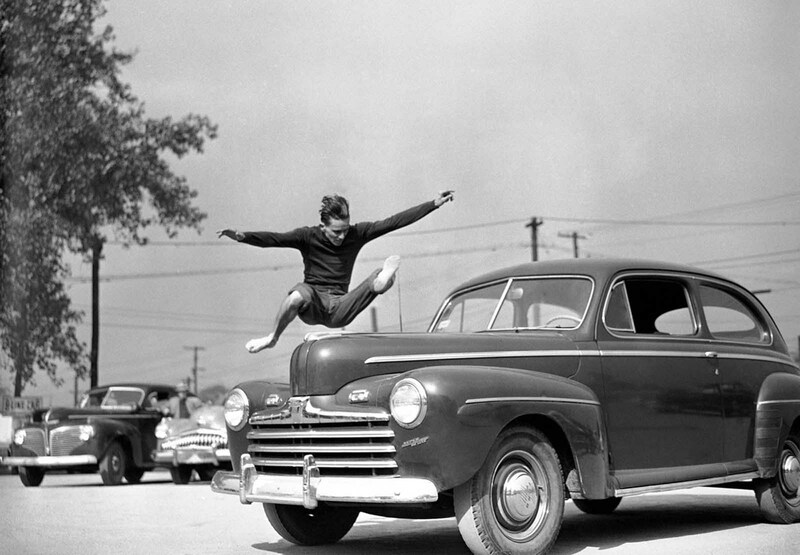 Jockey Freddie “The Fleet” Wirth, a 21-year-old from Louisville, Kentucky, demonstrates how he picked up some extra money in Detroit, when he bet fellow riders he could clear the hood of an automobile, October 29, 1949. Men and women, formerly employed in defense work, crowd Detroit branch of War Manpower Commission to file claims for unemployment benefits and also register for new jobs on August 17, 1945. 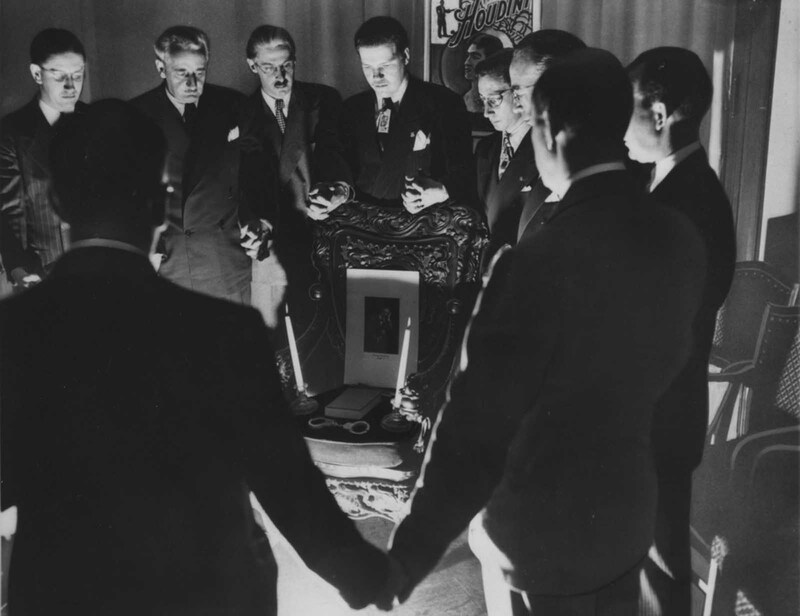 Thirteen magicians gather around a chair on which are a portrait of Houdini, two candles, a book, and handcuffs, for a midnight seance on Halloween, 1946, in Detroit, Michigan. 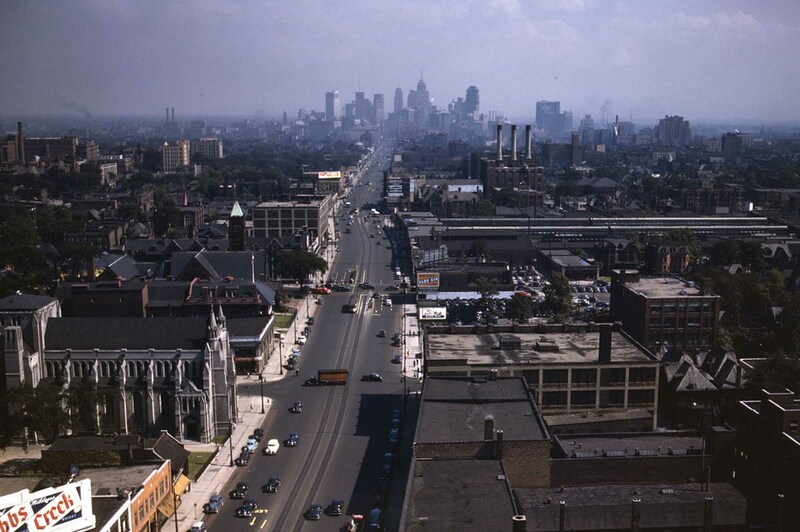 Looking south from the Maccabees Building with the Detroit skyline in the distance, July 1942. America was such a wonderful place before liberalism destroyed it. "Men and women, formerly employed in defense work, crowd Detroit branch of War Manpower Commission to file claims for unemployment benefits and also register for new jobs on August 17, 1945." Men? Where? It was considered an absolute disgrace for a man to take a government handout in 1945. There are no men in that line.